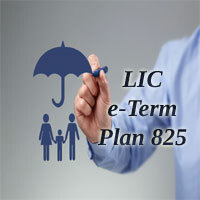 LIC e Term Policy 825 is a regular premium non-participating Online Term Policy that provides financial protection to the policyholder’s family in case of his/ her inappropriate demise. Plan No. 825 was introduced by the Life Insurance Corporation as per the new IRDA guidelines. The E Term Plan will be available through online application process only, and no mediators will be involved. The unique identification number (UIN) for this plan is 512N288V01. This UIN should be used in all relevant documents provided to the insured. Plan No. 825 is the first Online Term Plan and a yearly premium based plan meant for oneself. When compared with other LIC policies such as Amulya Jeevan and Anmol Jeevan term insurance policies, E-Term policy has very less premium. According to the LIC e Term Policy, the application of Non-smoker rates shall be based on the findings of the Urinary Cotinine test and in remaining cases aggregate premium rates will be applicable. What are the features of LIC Plan No. 825? Available through Online mode, i.e., at the official website of LIC. Different Premium rates for Aggregate or Non-smoker lives. Insured should not be Overseas Citizen of India(OCI) or Person of Indian Origin (PIO) and also he/ she must have own earned income. Key Man Insurance (KMI)/ Partnership/ Employer-Employee Cover will not be allowed for this plan. For Aggregate Category, Sum Assured upto Rs. 49,00,000 only would apply. But from Rs. 50,00,000 you have the option to choose whether you are smoker or non-smoker. Death Benefit: In case of an unfortunate death of the Life Assured during the policy term Sum Assured shall be payable. The Policyholder will get a guaranteed amount of INR 25 Lakh while the insured under non-smoker category could opt for minimal amount guaranteed at INR 50 Lakh. There is no ceiling on the upper limit on death assured. The nominee will receive the death benefit on demise of the policyholder. Maturity Benefit: As the e-Term plan is a complete life term policy, there are no Maturity benefits. Term Insurance plans doesn’t come up with any survival or maturity benefits. If anyone wants Maturity benefits, then TROP plan (Term Return of Premium) is suggested for them. NRIs can also buy this LIC Online term plan and will be covered even if they are abroad provided they are present in India for medical tests. Grace Period: A Grace Period of not less than 30 days will be allowed for the payment of premium. If the policy premium is not paid in an appropriate manner, the policy terminates. Cooling-off Period: The Insured may return the policy to the corporation within a fortnight i.e., a period of two weeks if he/she was not satisfied with the Terms and Conditions. Accidental death benefits are also provided under this LIC e Term Policy. How to Know your Category? If you are having any doubts regarding which category you belongs to, take a look at the below table. Based on the category the Sum assured shall be applicable to the nominee on demise of the insured. Before buying the LIC e Term Plan No 825 you can check your Premiums and Benefits using LIC e Term Premium Calculator. You have to enter the details such as Name, Age, Email-Id, Sum assured, and Policy term in the LIC e-Term Policy Premium Calculator. Are you planning to buy a new LIC plan? You can easily track your LIC policy online by registering your policy online. People who are comfortable in using the internet and experience of having made an online purchase, buying life insurance online is an easy process. It also saves your time and money. The Step by Step procedure for buying LIC e Term Policy 825 is mentioned below. You will be having two options, one for New customer and another for those who calculated previously. If you are a new user then mark on two options if you are residing in India, next click on confirm to continue and proceed. Otherwise enter 10 digit Access ID that was sent to your registered mobile number and email id. Fill the details such as sum assured, date of birth and policy term for calculating your premium annually and click on proceed to continue to the next step. Fill your personal details and contact information. Please remember that this online purchase is set for some cities only. So, if your city is not mentioned in drop down list then select nearest city. Keep the following details with you to complete the process of buying online. Form 16 or ITR of last three years. Details of Family members and Medical History. Bank details such as Account number, MICR code, etc. View the application or proposal form in the PDF format and modify if there are any corrections. Finally, proceed for buying the LIC E Term Policy through net-banking/credit card/debit card. Loan Facility: No Loan will be granted for this Lic Online Term Plan. Surrender Value: The LIC Term plan 825 doesn’t acquire any Surrender values. Policy Revival: If the premium was not paid within the grace period, then the policy will lapse. The Lapsed policy may be revived within a period of 24 months from the initial day of policy lapse. For the renewal process, the insured would once again have to undergo all the medical examinations. But the expenditure charges have to be borne by the candidates only. Riders: No riders are available in this Term Plan no 825. Medical test: Requirement of the Medical test will be based on the types of categories. But the test will be held in offline mode only. Suicide Clause: If the insured commits suicide for any reason within 12 months of the date of commencement of policy, then 80% of the premium for what he/ she had paid will be returned to their nominees or assignees. 1. Who should buy Term Insurance? A. Term insurance policies are best suited for working individuals who have dependents (Children, parents) and are looking for a considerable sum of protection against uncertainties of life (death) at fairly low prices. 2. What should be the duration of the policy? A. The term of your policy should be equal to the number of years your family is expected to be dependent on you financially. 3. Can a loan be taken for this LIC E Term Policy? A. Loan facility is not available for this online term plan. A. The Premium should be paid in online mode through Net Banking/ Credit card or Debit Card. Hello ..I am planning to buy e term plan 825 … But I don’t have any other lic policy… This is for 1st time I will buy lic plan.. So without any prior lic ploicy I can’t buy this plan..
What is the procedure to claim for E Term plan in case of death for assured person.